Today is a Monday that feels like a Tuesday due to having the day off of work yesterday for Family Day (hopefully I do remember that it is in fact Tuesday when I get to work and don't forget to take the garbage bin to the curb!). Thankfully the dreaded day of Monday is actually over and there are now only 4 days left until the weekend! I actually have a meeting for work in a city almost 2 hours away on Thursday and then Friday is my EDO and my sister and I are heading to the 'big' city of Yorkton to visit our friend Scooby so I'm only actually in my office two days this week (which will just make next week even harder when I'm at work the full five days haha). I worked at my second job both Saturday and Sunday (I usually only work Sundays) so I had decided on Friday that I deserved a day off to do absolutely nothing but watch Netflix or movies in bed. That was supposed to be the plan for Monday but that definitely didn't happen. For some reason I woke up early yesterday morning and I was inspired to clean and reorganize my entire bedroom. It was quite the task and took up most of my day (I did sneak an hour and a half nap in just before supper...). I was just tired of seeing all the mismatched items and since I've been acquiring a few new things here or there (all in grey/white) I just wanted to remove everything from the room that didn't go with the new 'theme' for my room that I'm aiming towards. I removed all the mismatched furniture (aside from one dresser because I needed something to put my tv on) and moved all the remaining furniture around for better flow and now it is SO empty and my voice echos because of the lack of furniture. I moved out two end tables and a large tv stand and just moving those things has made SO much empty space. Below is an idea of what I'm looking for to lighten up my bedroom. Having my bedroom in a basement I want to have as much light coloured things as possible to brighten everything up. My parents house is built into a hill and their basement is a walkout basement so I definitely get way more light than most basements but I still find it a bit darker than any upstairs bedroom. I finally took my Christmas tree down (by took it down I mean moved it - still completely decorated- to the spare bedroom that stores all my stuff) though my Christmas cards are still up and probably will be until at least Easter. Now that I have so much empty space that needs to be filled ASAP I'm on the hunt for a nightstand, headboard, tv stand, and dresser (all in white or grey). I actually might attempt a diy project and turn my dark dresser that is currently holding my tv into a nice white dresser with some new hardware - if I do I will definitely blog about it! I also bought myself a nice (and expensive) floor length mirror last summer but its black so if I can find a nice white one I'm going to buy it and then sell my black one on a garage sale site. I'm going to need to buy myself a TV too before camping season starts and I have to give my parents back their flat screen tv from their camper or else I will have to move my 19" TV/VCR combo that I've had since I was 12 back into my room (I reallllly don't want to do that!). Obviously all of these purchases aren't going to fit into my budget so I'm going to have to move some money around from my 'Operation Down Payment' savings to purchase some of this furniture. The upside is that I would have to buy that stuff at some point anyways so I figure its probably best to aquire some of it before I get a house so that I won't have to spend so much money all at once while also having a mortgage payment. I've been scouring Etsy/Pinterest for some prints to hang up. The space above where I moved my desk to looks way to empty right now and needs something to fill that space before it drives me crazy. If you know of any design shops/graphic designers that you love let me know! I'm also on the hunt for a new comforter or duvet set. Right now I'm using my Christmas blanket (bought at Marshalls two Christmases ago) and I don't think I'll change it over until I get something new. My other option is the black/white reversible comforter that I've had since my college days and I just really want to stay away from the dark colours. I currently don't have a bed skirt that fits on my queen bed and being able to see my boxspring drives me bonkers! My sister is also on the house hunt right now and has been wanting to make a trip to Winnipeg to the nearest Ikea to start getting a few things so I'm hoping we can make that happen soon - there are also Marshalls/Home Goods, etc that we can look for furniture/decor at, whereas at home there aren't any options other than Wal Mart (so not happening!). I desperately need a trip to Target too so if the exchange rate could hurry up and get better that would be great! Now that I've started the redecorating process I just want it to be complete so I can relax in the new space! 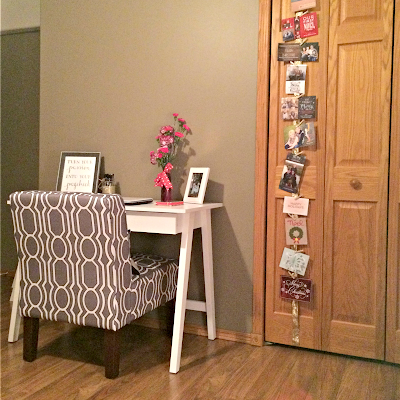 I love your gray/white color scheme! 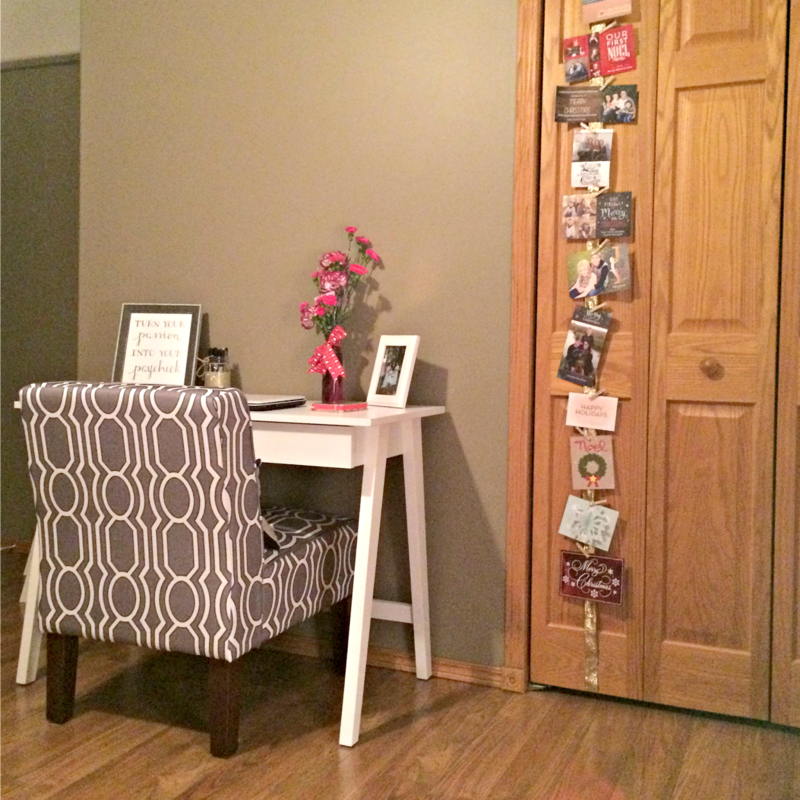 That picture of your desk and chair area looks so good! I also love your inspiration collage. I've been a rearranging fiend lately and I've opened up a bunch of space and now I'm like, "Okay so I need a console table here and another dresser here" and then I realize...how am I going to pay for this?! Ha!